Aberdeen defender Dom Ball has called for the SPFL to ban artificial pitches from the Scottish Premiership. Aberdeen’s Pittodrie was rated ninth pitch of the 12 pitches in the Scottish Premiership for the 2017-18 season. 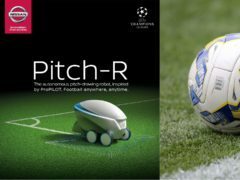 Football fans have been using their imaginations to create pitches for decades, but Nissan’s latest piece of technology might be about to make their job a little more straightforward. The head of leisure at a local authority has said he would leave “no stone unturned” to help provide a second artificial pitch in a North-east community. The Dons have spent a six-figure sum to ensure the problems with the much-criticised Pittodrie pitch are solved long-term. Complaints have been raised over the quality of an artificial pitch following repeated training session cancellations. CCTV could be installed at a new state-of-the-art all-weather pitch after it was targeted by firebugs. A NORTH-EAST youth football organisation has started a petition in a bid to have an astro turf pitch replaced. A NEW state-of-the-art sports facility was today described as a "dream come true" for an Aberdeen community.